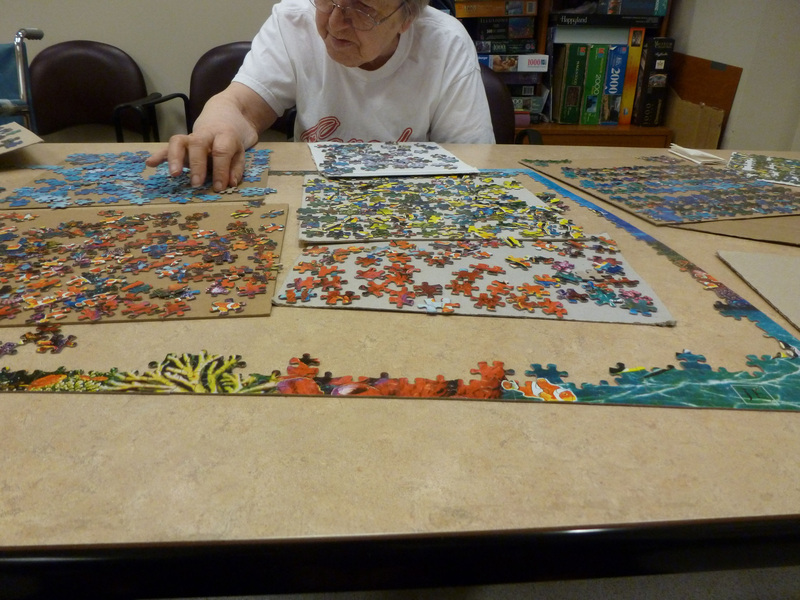 Here, where I live, there is a jigsaw puzzle being worked on every day. As soon as one is finished, they start another one. Occasionally I join them for an hour or so, but not that often. I am their official photographer and we have a record of every puzzle they have done! My blogging effort has been at a stand still, mainly because I didn’t have photos to include in whatever I thought I could write about. Yesterday I had my camera with me to photograph the last puzzle that they had finished. They had already started the next one… fifteen hundred pieces… of fish! Heh, why not take pictures of the beginning of a new effort? So that’s what I did! There are two or three people that work on the puzzles every day. A few come and join them once in a while. (Like me) They are fun to work on, and very relaxing… and addictive! Once I had a jigsaw puzzle made from a photograph I took of two bull elk grazing on somebody’s lawn. Now it’s framed like a picture. Norman, Kallie and Heather… thanks for dropping by and for you very welcome comments. The kettle is boiling, so lets have a cup of tea. I even have some peanut butter cookies! Ooooh! I hope I’m not too late for a peanut butter cookie. Love jigsaw puzzles, I do. I have several that I have worked and carefully re-boxed so that I can work them again. My two youngest grandchildren love jigsaws as well. Of course, since I grew up on the railroad, many of my puzzles have trains in them. Glad you were able to photograph the beginning of the puzzle. We’ll look forward to seeing the finished product. Hi Judith…welcome. I still have the peanut butter cookies, so pull up a chair while I make the tea. I do appreciate your visits, and your comments. Thanks for dropping by! My browser is causing me no end of problems, so forgive me for the delay in commenting. I’m finally getting a chance to say how interesting it is to see the puzzle at this stage. I’ll look forward to seeing it when completed. 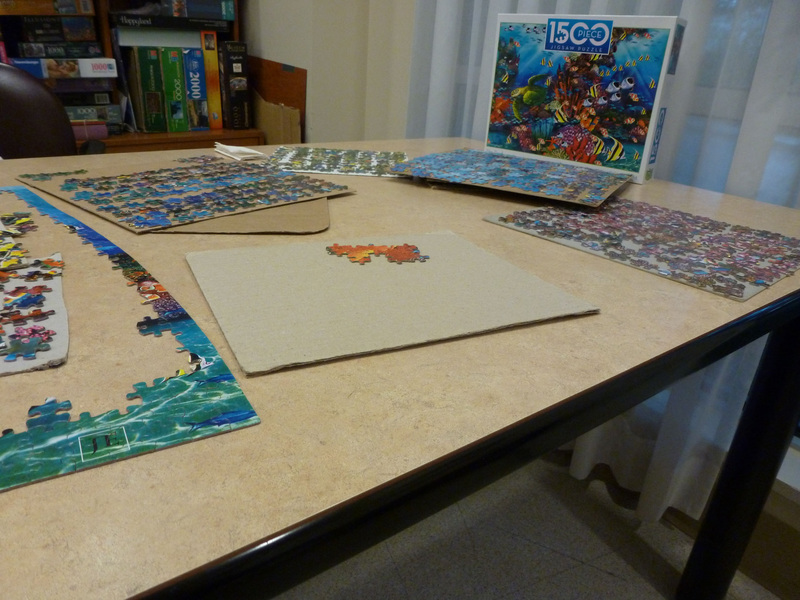 I’m not very patient when it comes to puzzles… all those little pieces!!! I’ll pour the tea, Carol! Pull up a chair. You don’t have any spare time to work on puzzles! I love all the gorgeous fish! But 1500 pieces…yikes. Jesse (my youngest son) is working on a 1000 piece puzzle of a space shuttle launch — loads of brilliant blue sky, and lots of white space shuttle and white exhaust clouds. It’s going to take a looooong time! Hi Shari! Thanks for stopping by and for your comment. The puzzle will keep Jesse occupied for some time! Tea? Cream? Sugar? Pull up a chair!